Ascension at Firepeak is a fast-playing fantasy card game for two to five players. In it, each player is a Wizard struggling to dominate the Wizard's Guild after the previous Archmage passes away. Each player secures the services of fantastic creatures, ranging from the lowly Fairies and Henchmen to the powerful Dragons and Giants, to dominate their opponents and ascend to the head of the guild. 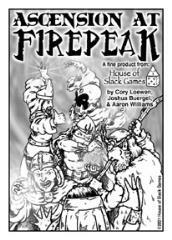 Beautifully illustrated by Aaron Williams, Ascension at Firepeak is a fun and fast playing way to lob a couple of spells at your friends.